MALABO, Equatorial Guinea- The Government of Equatorial Guinea favors full implementation of the Free Movement Agreement of the Economic and Monetary Community of Central Africa (CEMAC) Area, and will support efforts of CEMAC countries to implement all conditions and technical requirements leading to an eventual free movement of persons among the signatory states, the government said in a statement issued yesterday. The government of Equatorial Guinea decided not to apply the agreement in its territory during a meeting of the Council of Ministers on November 8, 2013. 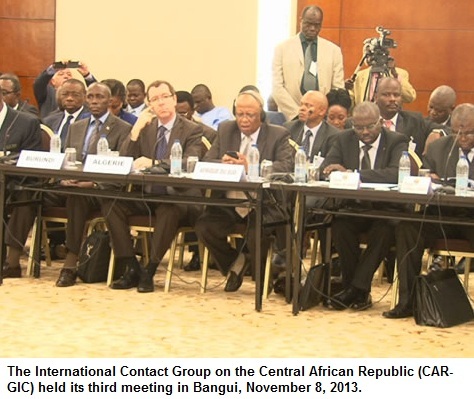 The government explained afterward that there are still several requirements and condition—to be carried out in stages—that CEMAC States must meet and comply with. In addition, the agreement must be approved by both houses of Equatorial Guinea’s Parliament. The Minister explained that Equatorial Guinea’s position is that because the recommendations that were made by the Heads of State of the CEMAC zone have not yet been fully implemented, it would be premature for the agreement to enter into force. Many of the requirements are intended to prepare the way for the orderly free movement of persons. Until they are in effect, the area risked a chaotic movement of people. For close to two decades now, oil money has been flowing into Equatorial Guinea’s economy, but hopes that poverty could soon be history have not been fulfilled. The country’s president rules with an iron hand. Thanks to the discovery of the much prized “black gold” and natural gas, Equatorial Guinea is comfortably placed as the country with the highest Gross Domestic Product (GDP) in Africa. In 2012, Equatorial Guinea’s GDP per capita income was estimated at $20,200 (14,900 euros), also a result of the discovery and exploitation of its oil and gas reserves and the economic growth that followed. It is against this background that there has been an influx of both skilled and unskilled labor into the country not only from neighboring countries like Benin but also from as far away as Latin America. Now Equatorial Guinea boasts numerous construction sites that include bridges, roads and new ministerial buildings. Reason enough, supporters say, for the country’s leader Teodoro Obiang Nguema, who has been in power since 1979, not to leave office. One of the sites that has attracted skilled laborers is the Punta Europa Gas Plant located on Bioko Island near the country’s capital Malabo. Visitors are greeted by a recorded French message on loudspeakers, advising them for safety reasons to switch off their mobile phones. In 2010, barely 3 years after the plant was constructed, the government of Equatorial Guinea announced that it had a capacity of 4.5 trillion cubic feet of natural gas. This and other huge quantities of petroleum resources discovered since 1996 propelled the country to the position of third largest oil producer in sub Saharan Africa. Gas exploration engineer Jean Essono works at the plant. He was born in Cameroon and returned to work there after completing his training in France. “It is the biggest gas factory in the world. You can only compare it with those in America,” he told DW. Apetoh Mesong, a 40 year-old from Benin, has set up an ICT center in Malabo and installs surveillance equipment for different companies. Mikes Oliveder came from Brazil to work as a bridge construction engineer. He is happy that Equatorial Guinea has invested in different projects thus creating job opportunities for people like him. President Teodoro Obiang Nguema’s government has been widely criticized for its lack of transparency and misuse of oil revenues. This is largely because of his dictatorial style of leadership and nepotism. Obiang Nguema is known to rule with an iron fist and international human rights and anti-corruption watchdogs, such as Human Rights Watch and Transparency International, say abuses under his rule have included unlawful killings by security forces, government-sanctioned kidnappings and the systematic torture of prisoners and detainees by security forces. Because of the climate of fear that exists, few dare to question the decisions he makes. Berte Mballa, a journalist in Malabo told DW that much of the extracted gas is exported to countries like China and the US. This has created anger within the local population. Mariano Essumo Nguema, a traditional ruler of Nganmessock, near the port city of Bata, told DW that his country was going through a revolution. Meanwhile, President Teodoro Obiang Nguema complains that a dark picture is painted of his country in Europe. “They qualify Equatorial Guinea as a country that does not respect democratic principles, as a country that violates human rights and that practices corruption,” said Obiang. Transparency International currently ranks Equatorial Guinea among the top 12 in its list of most corrupt states.